My wife and I love asparagus. We usually put it on a skillet with olive oil, garlic, salt and pepper and roast it till it's nice and slightly brown, and have it with pasta and sauce as a side dish. This time around I decided to bake it in the oven instead, and made some additions to the ingredients to make it more interesting. Wash the asparagus and cut off the hard end part of the stem which is very light in color, usually around 1 to 2 inches from the bottom. Smash the garlic cloves, chop into small pieces and set aside. In a baking tray, lay the asparagus, covering the entire baking tray. Add the garlic, extra virgin olive oil, some cayenne pepper (based on your 'heat' index), walnuts, fresh rosemary leaves, and salt and pepper for seasoning. With your hands toss and turn until everything mixes well. 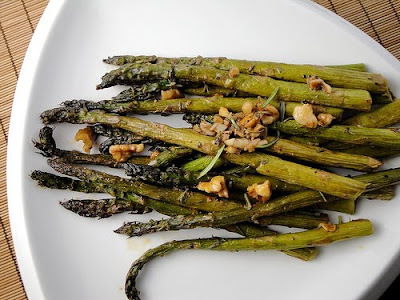 Put the tray in the oven and bake until the asparagus is slightly brown, a little crunchy. Serve warm with some great pasta and sauce, or just eat it as is. Although I didn't, you may sprinkle some dry grated cheese in the end to add more flavor if you would like.